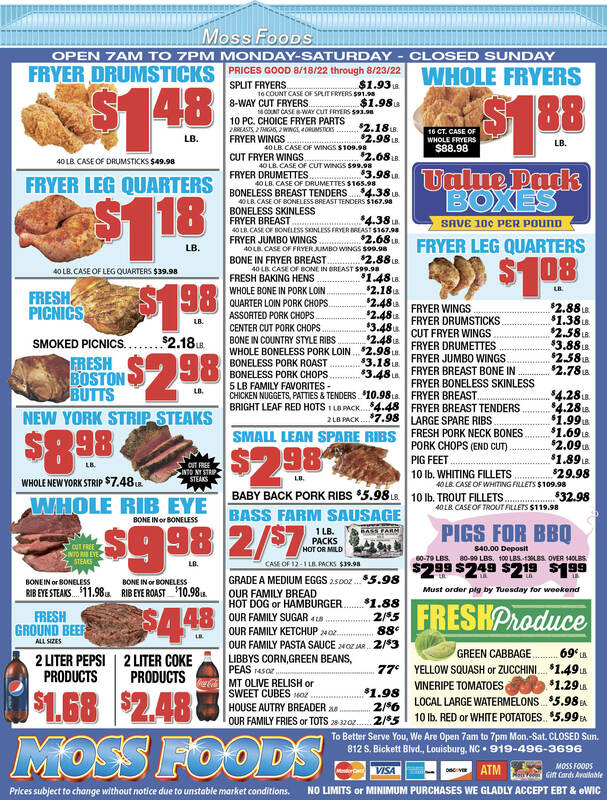 Showing 38 articles from March 1, 2013. 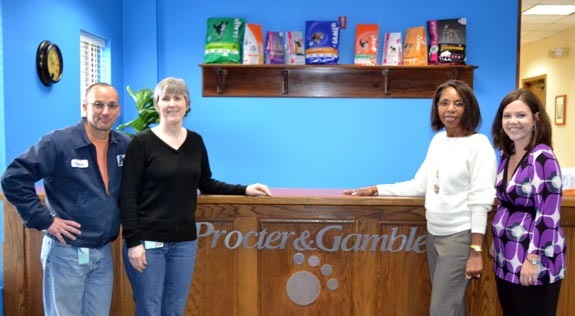 YOUNGSVILLE — An organization that benefits animals in need got a shot in the arm when a Louisburg businesswoman left it money. Now, after a recent meeting, the SPCA of Franklin County is starting to get the bodies it will need to buoy what had been a one-woman operation. “It went well,” SPCA founder Rebecca Rodgers said of last Saturday’s meeting. 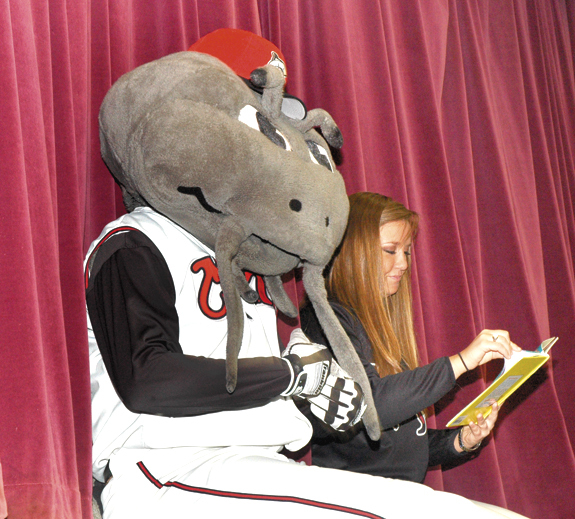 Muddy the Mudcat, above, with Lindsey Lynch, the Mudcats director of community relations, read to Youngsville Elementary School students on Friday. Have questions about why North Carolina’s legislators decided not to expand Medicaid? Wonder why legislators slashed unemployment benefits — and the length of time those benefits will be paid? Concerned about why North Carolina is not creating health care exchanges as part of health care reform, instead of requiring Tar Heels to rely on a federal exchange system? BUNN — The town is set to blow out some candles Monday night, but it doesn’t mark the end of a celebration. The town of Bunn was established on March 3, 1913, officials say. LOUISBURG — Parks and recreation advisors held their last meeting before presenting commissioners with options for a new county park. The board met in a special-called meeting on Feb. 26, prior to a March 18 county board of commissioners meeting where the group is set to present officials with three proposed sites for a new park. ECSTATIC. Happy North Carolina fan and county Existing Industries Coordinator Richie Duncan greets UNC great Phil Ford after bidding on a game ticket package. LOUISBURG — He was the ACC’s player of the year, the NBA’s rookie of the year, and won titles as an assistant in college and in the professional ranks. This year, Phil Ford added another title to his resumé — champion of the uninsured. 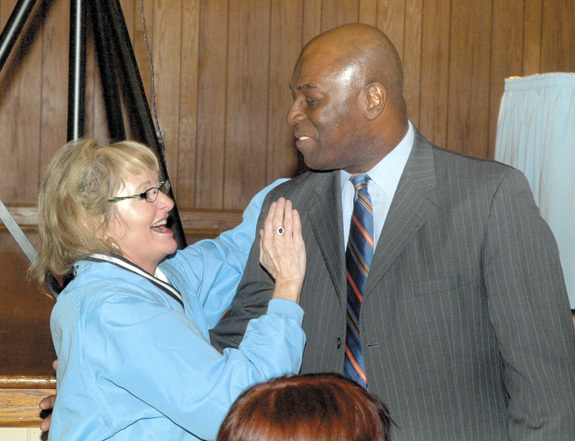 Through his Phil Ford Foundation, the former University of North Carolina basketball star has agreed to bolster the efforts of local free clinics, including the Franklin County Volunteers in Medicine. GOOD MORNING: Harking back to the days when I was the county’s “go-to” guy for radio stuff as a result of my years of experience, first as a WW11 Navy radioman and later as chief engineer at the local radio station, got me to thinking about this FCC check on interference that’s bugging the county’s new $10.6 million radio system. Now, let me tell you how I think this is most likely to work out. As of yesterday, March 1, it’s been 22 years since I walked out of the old Louisburg First Citizens Bank building at the corner of Nash and Bickett — an architectural treasure that should have been preserved — and crossed Bickett to tell an unsuspecting staff that the county’s newspaper had a new owner — me! Actually, I‘ve always disliked the concept of “owning” a newspaper, preferring to consider myself a caretaker of a community institution that is now into its 143rd year. You know the old definition of a padlock, right? It’s a device designed to keep an honest man honest, not thwart a determined thief who could just break it or cut it out of his way. 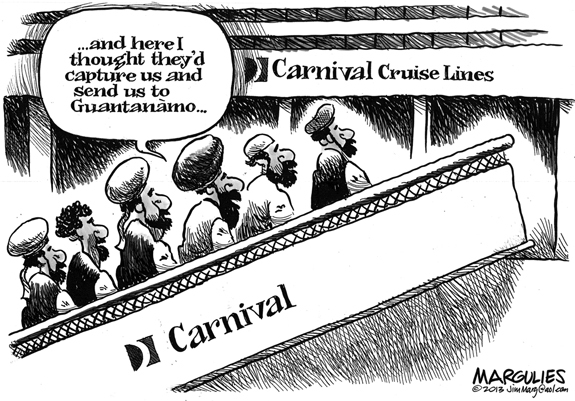 Perhaps that’s how we should look at the federal Voting Rights Act that is now under review by the U.S. Supreme Court. LOUISBURG - Dorothy Eaton, 77, died Tuesday, Feb. 26, 2013. CASTALIA - Kevin G. Brake, 50, died Monday, Feb. 25, 2013 at his home. A graveside service will be held at 1:30 p.m. Saturday, March 2, at the Brake family cemetery, 27 King Road, Castalia. YOUNGSVILLE —Joyce Johnston, 85, died Wednesday, Feb. 27, 2013 in Raleigh after complications from a fall on Monday. Funeral services were held Friday, March 1, at Owens Funeral Service Chapel, Lebanon, Va., with the Rev. Duane Musick officiating. BUNN - Mary Yarborough, 91 died Thursday, Feb. 28, 2013. ATLANTA - Leon Louis Pippin, 83, died Tuesday, Feb. 19, 2013 in Atlanta, Ga., where he had lived for the past five years. RALEIGH - Aaron W. Ray, 84, died Thursday, Feb. 28, 2013. 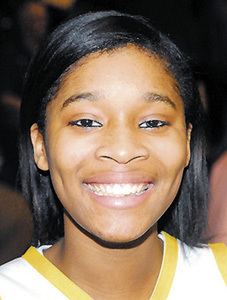 Funeral service will be held at 2 p.m. Sunday, March 3, at Bryan-Lee Funeral Home, Garner. Burial will follow in Montlawn Memorial Park. BHS’ LUCKY 13. Kiera Gallatin drives in the paint for the Bunn Ladycats during Wednesday night’s home playoff decision against Bertie High School. BUNN -- Bunn’s ascent toward the summit of the Class 2-A State Girls Basketball Playoffs was almost diverted by a pair of major obstacles. The first was man-made in the form of the Bertie Lady Falcons, who owned a substantial size advantage in the paint during Wednesday’s second-round postseason showdown at the Bunn Dome. 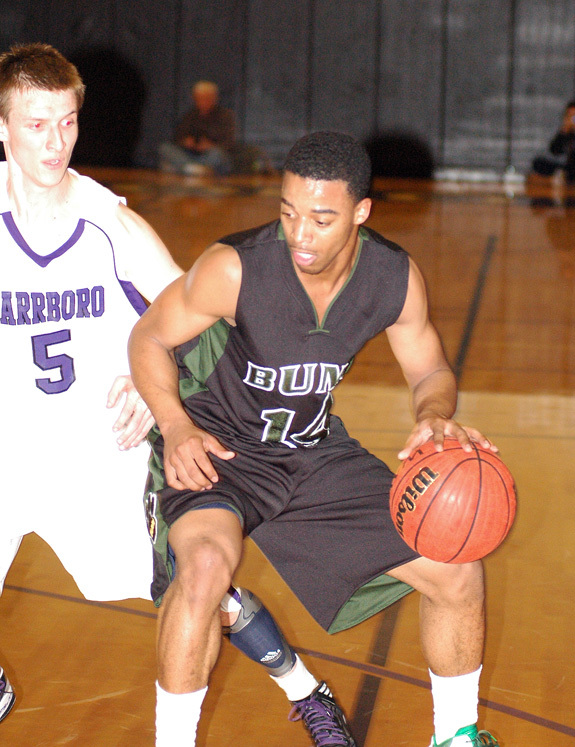 CARRBORO — The road to Farmville Central was paved Wednesday night right down the lane of the Carrboro Jaguars’ Gymnasium. That’s where the two-man tandem of Johnathan Alston and Deshawn High connected on a pressure-packed play that kept the Bunn High boys basketball playoff push alive. ON TARGET AT LHS. Louisburg’s Luke Anders returns a forehand during Thursday afternoon’s home tennis match against the Southern Nash Firebirds. LOUISBURG -- Louisburg High School’s boys tennis team will feature an interesting mix of experienced seniors and potential-rich sophomores -- along with a talented freshman that has instantly become the squad’s No. 1 Singles player. That standout is Alejandro Rivera, who lined up in the top spot Thursday as the Warriors opened their campaign with a 9-0 home loss against perennial powerhouse Southern Nash. FUTURE CANE. 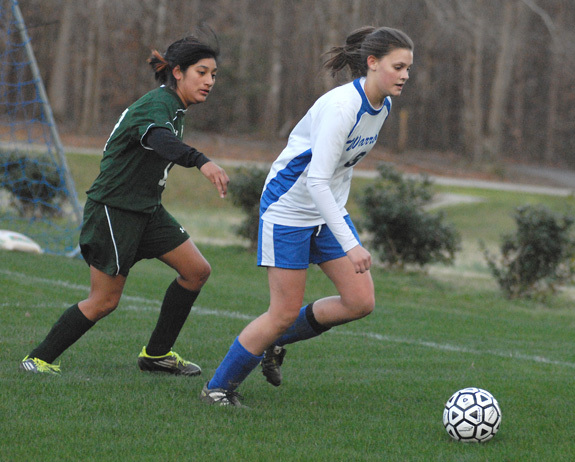 Louisburg High School senior standout Kelsey Harris (right) will continue her soccer career right down the street at Louisburg College. LOUISBURG -- Thanks to last season’s national tournament appearance -- and the exposure that comes with it -- Louisburg College’s women’s soccer program has seen an uptick in its international recruiting exposure. But LC head coach Andy Stokes didn’t have to travel far to land his first signee for the 2013 class. Just down the street, in fact. CARY -- The Louisburg College baseball team had another strong offensive performance in a midweek 8-1 win over Wake Tech CC on Wednesday afternoon. The ‘Canes pounded out a total of 15 hits as they improved to 5-2. John McGillicuddy got the start on the mound where he didn’t surrender any earned runs en route to the win. 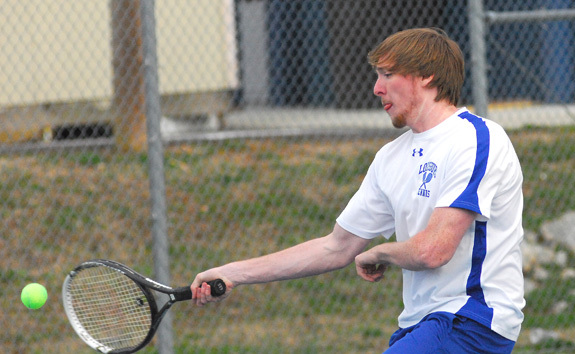 FRANKLINTON -- Franklinton High School opened its 2013 boys tennis season on Thursday with a home loss to the South Granville Vikings. The team score was 6-3 in favor of the Vikes. The Red Rams, coached by Nathan Moreschi, won two singles matches, along with a doubles conquest. 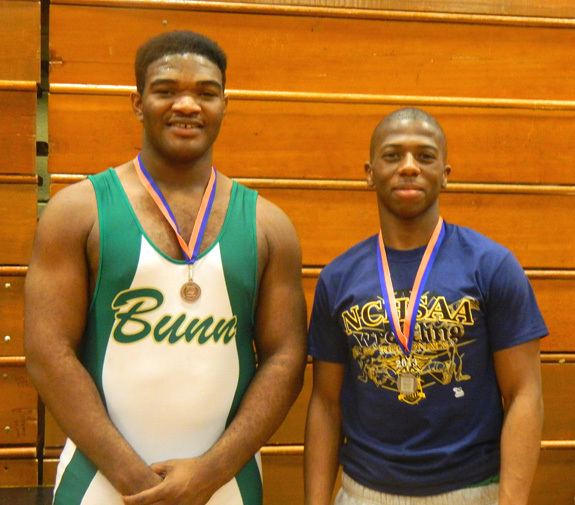 BUNN -- Randy Kagarise’s plan to build Bunn High School into an area wrestling powerhouse took another huge step this season. Not only did the Wildcats post an overall team winning record, they also qualified two performers for the Class 2-A State Wrestling Championships, which are being held this weekend at Greensboro Coliseum. RALEIGH -- The Carolina Hurricanes currently hold on to a very slim lead in the Southeast Division of the National Hockey League. They had a golden opportunity to take the lead outright last Saturday at the PNC Arena as they hosted the Tampa Bay Lightning, but the Lightning prevailed 5-2. 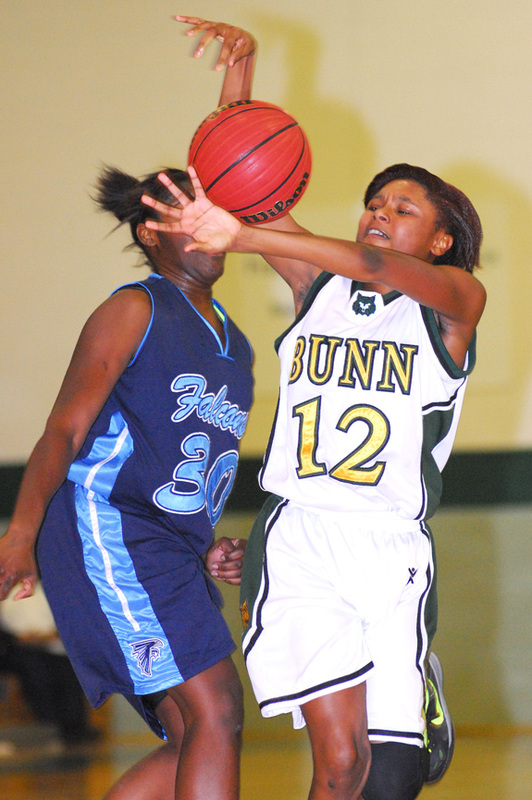 Bunn’s Keella Gallatin (right) tries to gain possession of a loose ball during Wednesday’s playoff victory at home vs. the Bertie Lady Falcons. 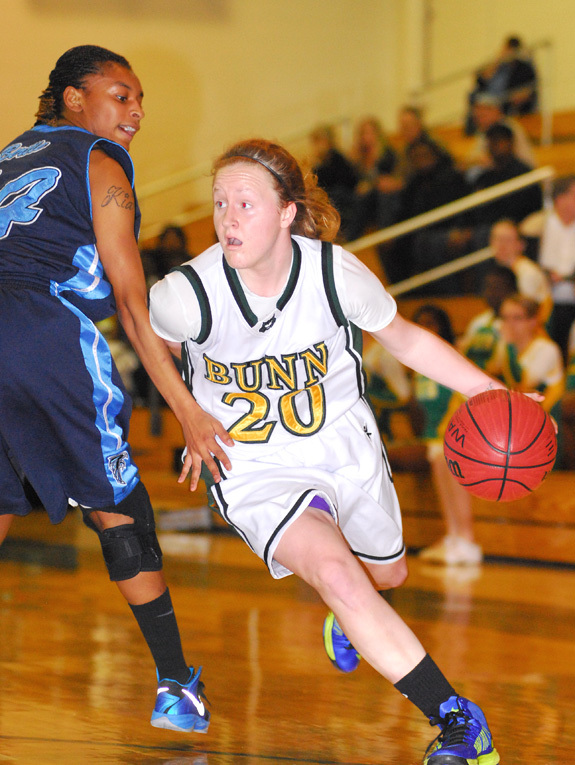 Precious Walker didn’t play like a freshman for the Bunn Ladycats during Wednesday’s playoff win over Bertie. 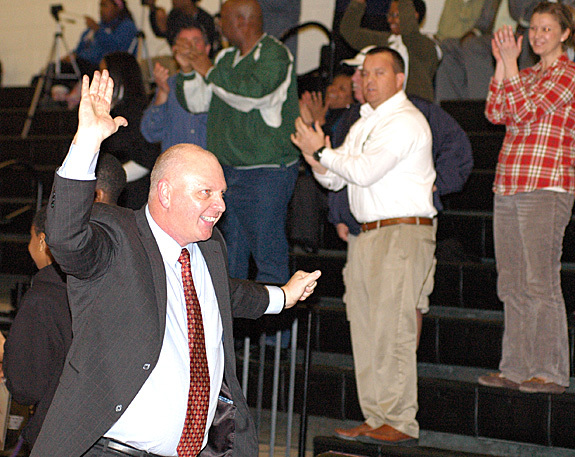 Bunn Coach Gerald Melton thanks fans after Wednesday night’s playoff decision at Carrboro. 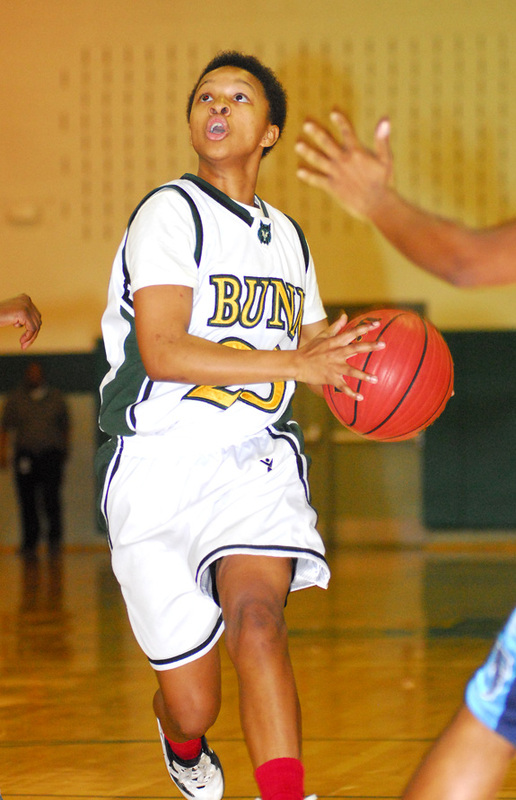 Bunn’s Whitney Bunn (with ball) looks to find an open teammate for the Ladycats during Wednesday’s game versus Bertie in the second round of the Class 2-A State Playoffs. Franklinton native Natasha Ann Wetzel held a book signing at the Franklinton Library last week. 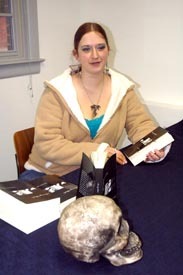 She was signing copies of her book, “Starving Blades,” the first novel in a series. It is available through Amazon, Kindle, Barnes and Noble/Nook or www.createspace.com/4074514. LOUISBURG — Prosecutors and attorneys continue to wait upon information they expect will determine whether a juvenile faces charges as an adult. In August, investigators arrested Shannon Nyamodi and a girl who was 15 at the time, alleging they conspired to kill Rhonda Maclean and steal about $50,000. A local children’s educational group has received a reading program grant to boost its endeavors. The Franklin-Granville-Vance Smart Start will use the money from P&G to provide students with a good foundation. Since its inception, P&G has improved life for more than 400 million children around the world through their Live, Learn and Thrive cause. Louisburg police are looking for a suspect who tried to steal a woman’s car at gunpoint. The evening of Feb. 26, a 39-year-old Louisburg woman reported that she was at a laundromat on N. Bickett Boulevard when a man came inside with a gun. After asking who owned the sport utility vehicle in the parking lot, he forced the woman out to the vehicle and would not let a laundromat employee leave. LOUISBURG – Novant Health announced a plan to unify all facilities in the system under the umbrella name, Novant Health — including the Louisburg facility. Franklin Regional Medical Center will become Novant Health Franklin Medical Center. Formed in 1997, Novant Health has grown from four to 13 acute care facilities, more than 100 outpatient facilities and over 350 physician practice facilities in four states.